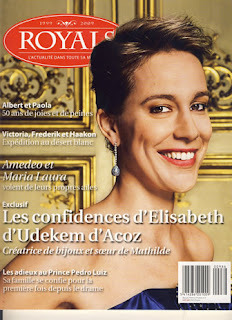 Mathilde's sister, countess Elisabeth d'Udekem has always avoided talking to the press, with one exception: a 2009 interview and photoshoot for Belgian media focusing on her hobby, designing jewellery - even though she has no brand and she stipulated she wants her work to be a mouth to mouth business. Since the marriage of Mathilde d’Udekem d’Acoz – 4th December 1999 – to the future king of the Belgians, the noble house d’Udekem d’Acoz has become a known name among the European gotha. Elisabeth is the third daughter of count Patrick d’Udekem d’Acoz, who died on 25th September 2008, and Polish countess Anne Komorowska. On the 22nd July 2006, then 29-year old Elisabeth joined marquis Alfonso Pallavicini at the altar. In 2008 they had a beautiful daughter, Olimpia, and for years now Elisabeth has been designing jewellery. In the majestic scenery of the castle of Beloeil, I have an appointment with Mathilde’s sister, countess Elisabeth. Beforehand we run through the decors that will be used for the photo shoot, with the hostess – the princess de Ligne. The antique interiors ooze calm, the gardens look magnificent. A good photo session is a must for a comfortable interview. The woman who arrives is tall, slim and elegant. Dark Valentino jeans, purple short-sleeved blouse and a cashmere scarf with flowers. On her left hand she wears two rings, one of them her wedding ring with a stone she recieved from her husband. They discussed the design for hours. “This is my most precious jewel”, she says. One by one she places her latest creations on the table. Her pearls are safely tucked away in little jewel boxes she takes out of a Formes Paris paper bag (pregnancy clothing). Stylist Saskia takes a close look at the jewels and together we talk about wich jewels to use with each outfit. Beautician Ann completes the look. Madam, did you have a passion for jewellery from early on? What’s the creation process of a jewel like? Elisabeth’s passionate when we talk about the secrets of gemmology. “Diamonds and the ‘big three’ (ruby, sapphire, emerald) are known by everybody.” But the countess also likes working with lesser known stones like aquamarine, tourmaline or tanzanite. She even uses yellow and pink beril, or rubelite. “I had the chance of getting to know some stones at home, but it wasn’t untill I was at school that I realized the huge quantity of minerals and stones.” Of course the noble family d’Udekem d’Acoz has some nice jewels. Elisabeth loves to wear them. As does her sister Mathilde at special occasions. But she won’t go as far as transforming them to give them a more personal touch. “They have too big a sentimental value for me”. The same goes for the creations the countess makes for herself. She sometimes has trouble parting with pieces for exhibitions. Jewels can be like a second skin. Some people feel ‘naked’ without them. Does this go for you as well?